This month’s blog covers an end of term at Sturt, Context Art in the Blue Mountains, the start of a new term and looms. But first… Autumn has arrived. The colours are spectacular and the leaves are falling in great drifts. The following is some Sturt student’s work at the end of term 1. For some there was a big effort to finish as they would not be returning in Term 2 or they use the end of term as a goal to finish work ready for a new project. For others a project will continue on. 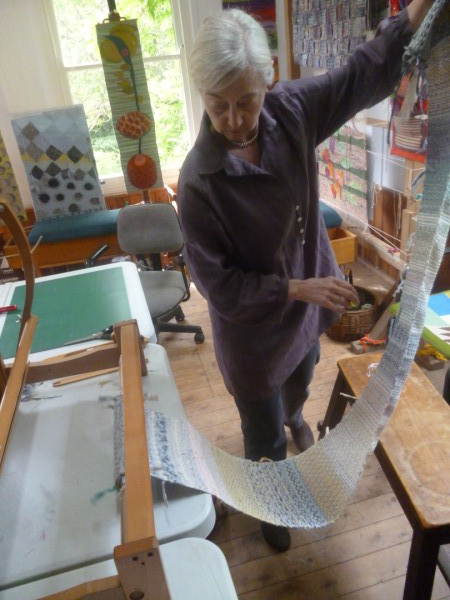 Virginia with her run of tablemats exploring treadling variations of Summer and Winter. 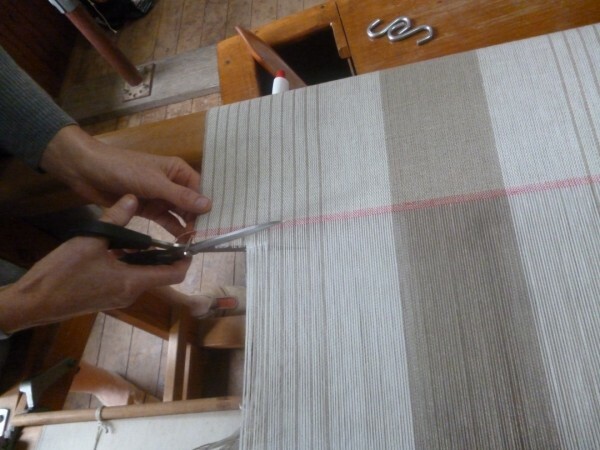 Marcia examines her fabric length woven on just 4 shafts. 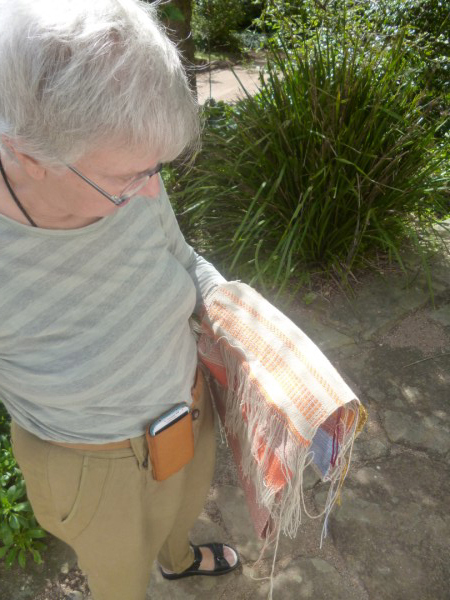 Maggie examines her fabric lenght woven from strips of recycled shirts. Lou cuts of her run of linen tea towels. 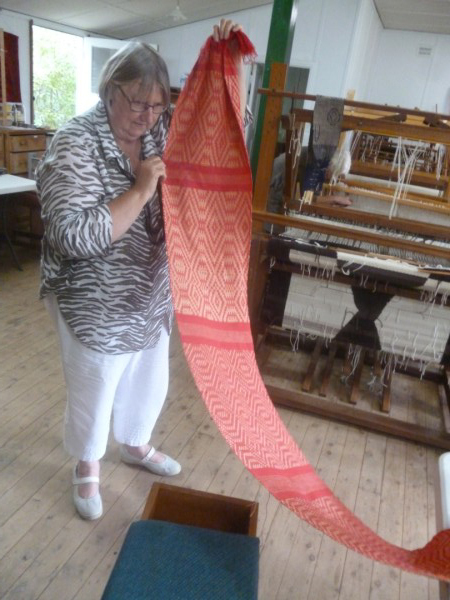 Belinda examines her 8 shaft colour and weave twill scarf. The end of term also saw the launch in Sturt gallery of an interesting exhibition for the textile enthusiasts, Ordinary/Extraordinary by Dimity Kidston and Al Munro. Work includes tapestry, digital prints and crochet vessels. It runs till 1st June so there is still time to visit. 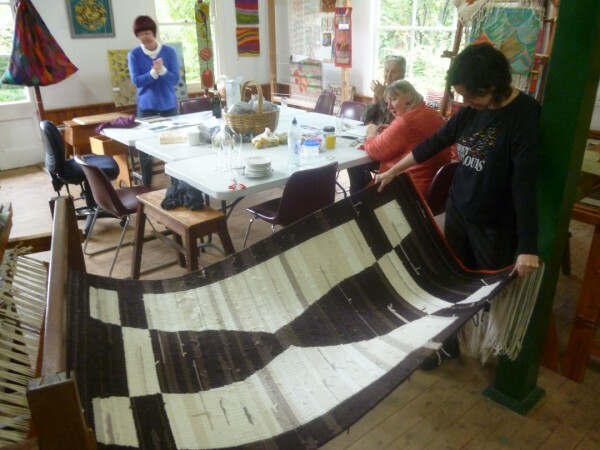 Dimity teaches a weekly tapestry class at Sturt. 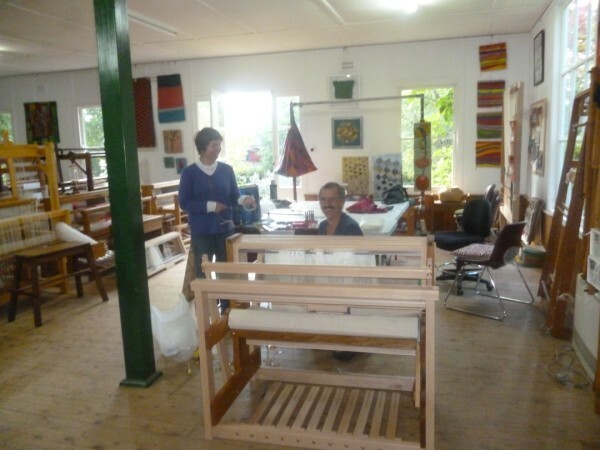 In conjunction with their exhibition, her students put on a display of their work in the weaving studio. 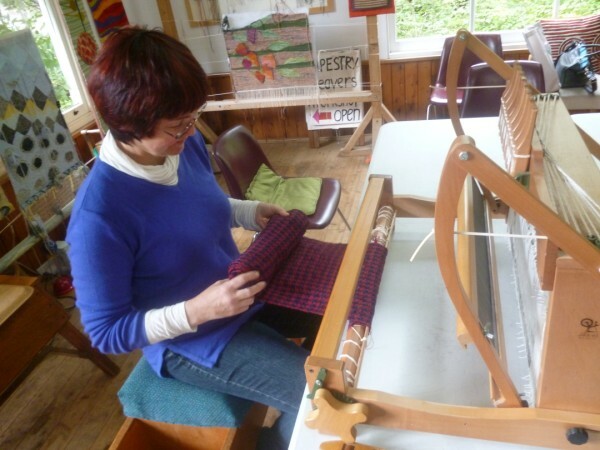 It was a great opportunity to show what the students have learnt and to promote tapestry weaving. Check out the backgrounds of some images that show how the studio currently looks. These are just a few of the diverse work that was produced. 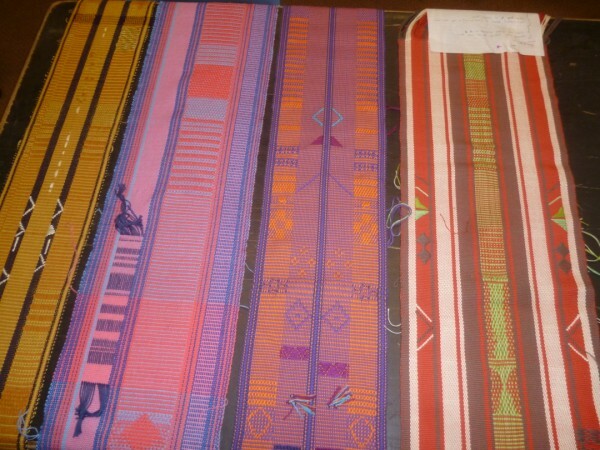 Everyone designed their own warps. Many chose to do only samples while others also worked on a final project. By the way next year’s Fibre’s Ballarat program has also been launched where I will again be teaching next Easter. http://fibrearts.jigsy.com/ for information about Fibre Arts Australia events. 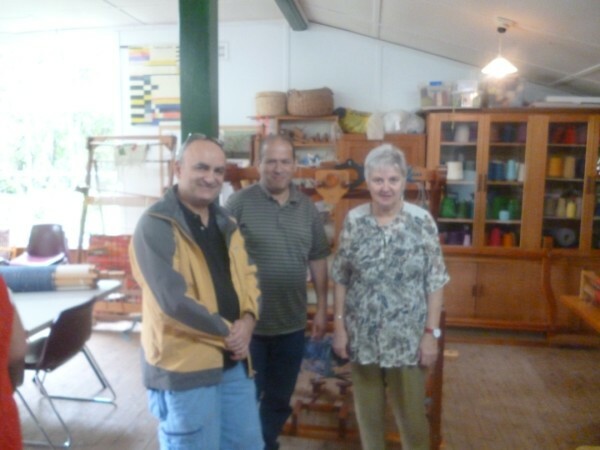 A new loom and associated weaving equipment has arrived though the generous donation of Marjorie Eve Ey. It is an eight shaft Meccia mechanical dobby. A student, Marcia and some of her friends who were visiting got roped into lending a hand to put it back together. Thank you helpers. It was so much easier with a few extra pairs of hands. 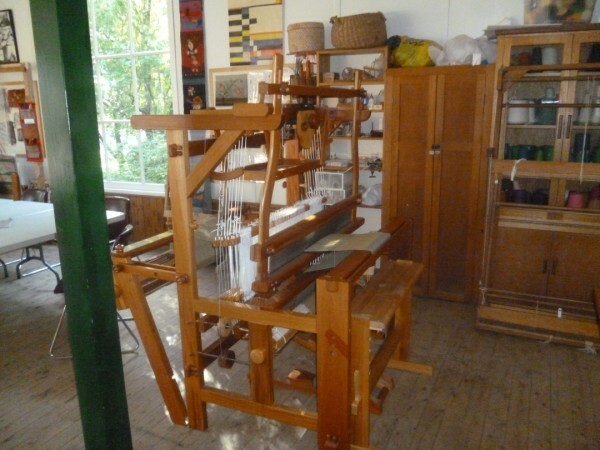 A long warp has been put on; enough for each student to weave a tea towel. A design challenge has been issued. Each student has to create a design that will fit into an 8 x 8 square grid. The squares must not be coloured in nor left blank either vertically or horizontally for more than 3 squares. They will need to check that this is maintained when their pattern is repeated. As many of these students are either beginner weavers or have had little experience with design, this is a great nonthreatening way to become comfortable with design. At this stage there has been no reference to “labels” of weave structure. It is purely a colouring in exercise. It is going to be very interesting to see the diversity of results. A second loom has been delivered by Doug Rosemond who collaborated with me and developed a loom as part of the Diploma course at Sturt last year. The result appeared in the student’s end of year exhibition and has been trialled since then with great results. This is loom 1 of production, bought by Belinda to work on at Sturt. She just can’t wait to get started. 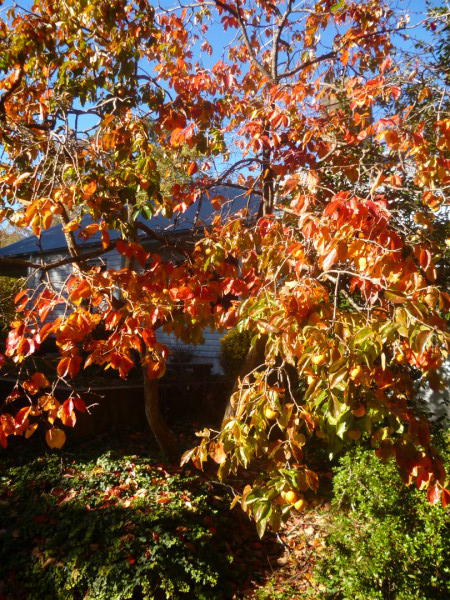 The persimmon tree outside my bedsit. The colours are glorious and the birds have discovered the fruit. You are currently browsing the Kay Faulkner's Blog blog archives for May, 2014.